Is using compressed air safe? There are over 10 million paintball players in the US alone that use this technology. The tanks are Department of Transportation (DOT) certified for automotive use and are used frequently in non-paintball applications as a result (the Ninja guys have some great stories, from automotive racing to special ops applications). The actuator pressures used by KickMagic are regulated down to the range of shop air. All KickMagic pneumatic equipment is rated for these pressures with engineering safety margins. Will it look out of place on my vintage motorcycle? We have really enjoyed putting the time necessary into making KickMagic look like it could have come from the factory, or at least from a high quality aftermarket period supplier. OK, so we are not Paul Dunstall, but we spent a lot of time with our favorite industrial design major, art teacher and vintage bobber bike builder biL (as he is known) of Wooden Piston Designs here in Vermont. His basic message was to pick up design cues from the bike itself and keep it in the genre of “futurism”, which is the root of the mechanical sculpture that makes these bikes so appealing. The pneumatic actuator mimics the mufflers. And, finally, the system is designed to have the major components removed quickly for storage or just keeping the stock look as you park the bike in your bedroom for the winter. The satchel comes off with a few buckles, the actuator and mounting plate comes off with three bolts, the combination shaft with one, pneumatic lines are all quick disconnect and only two connectors need to be undone to complete the task. We do recommend leaving the dash in place as it is a bit more involved, but you get the idea. Are there any permanent changes to my motorcycle? No, all parts bolt on and bolt off. The major components can be removed and reinstalled in minutes. Initial installation can be accomplished in under 3 hours with common tools. How do I use the KickMagic Starter? All vintage motorcycle owners know the drill of prepping the bike to start – petcocks on, tickle the carbs, choke on, clear the clutch, position kickstarter at max compression, ignition on, etc. – and that is no different when using KickMagic. So, the first thing to do is get your bike ready to start the way you normally do. The air source will be either shop air or an on-board tank. Switching between the two is as easy as plugging in a normal shop air quick disconnect. The KickMagic simple control panel is mounted on the dash with two buttons and three indicator lights. The master arm button illuminates the red ARM light, letting you know the system is energized. Placing your kick start lever in the ready-to-kick position illuminates the yellow READY light. Now push the start button and the green START light indicates there is now 5 seconds of air pressure to attempt your kick. The system then times out and you are ready for another attempt if necessary. Yup, so easy a kid can do it……and has ! Where can I get my tanks refilled? There are several options for filling KickMagic on-board tanks. Please note that the tanks are compatible with high pressure air or nitrogen, but not yet qualified for use with CO2 (but we are working on it). KickMagic on-board tanks can be refilled at commercial fill stations, by utilizing a High Pressure Fill Station and large capacity storage bottle, or High Home Pressure Systems (which are quite new to the market). Please see “Air Supply Options” page for more information. Please note: Not all tanks and regulators are compatible with all gases. KickMagic tanks and regulators are manufactured by Ninja, a prominent US paintball equipment supplier. Our tanks are marked with the KickMagic logo and are priced competitively with mainstream paintball systems. How many “starts” are stored in a tank? For you physics fans, it all goes back to Boyle’s Gas Law (remember him?). Well, P1 x V1 = P2 x V2 (almost… cheating a bit here, as the process is not adiabatic). Simply speaking, more volume and more pressure means more starts. Our standard 50 cu-in tank at 4500 psi will typically yield 90 attempts (Please note, I say attempts. Attempts become actual starts if your motorcycle is running well!). 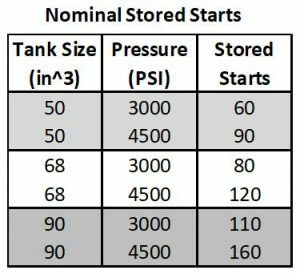 Different pressures and different tank sizes provide different amounts of stored energy (and, hence, start attempts). The table at the right has been verified through testing at ambient conditions. Please refer to the owner’s manual for more information and tips on conserving your stored bottle air. What about high or low compression engines? On board, KickMagic tanks have an adjustable low pressure regulator (the LPR) that you set once, based upon your engine’s compression and the kick force it requires. This is typically 75 to 100 psi. When using shop air, the adjustment is made at the compressor output regulator. How much electrical power does it use? A total KickMagic system uses less than two (2) amps at 12V dc and can run on POS or NEG ground systems. Notably, the duty cycle is very short as the system is only energized during start attempts, and there will be an insignificant drain on the battery. There is no modification to the bike’s wiring harness or amp rating on the fuse. The KickMagic power cable is wired in after the motorcycle ignition power and has its own internal fuse. For OIF Triumphs, for example, the system comes with a three way spade to connect at the flasher unit (White wire, NEG) and a ground eye to attach at either the battery or suitable engine or frame location (Red wire, POS). Just make sure it is a good, non-skanky ground! How about other makes and models? KickMagic LLC’s intellectual property and patent applies to the engineering associated with the pneumatic system, its controls and the mechanical interface that engages with the kick-start shaft. KickMagic will be developing point solutions for other bikes on a regular basis depending upon market demand. For example, if there is an owner’s group that wants to approach us about developing a solution for their bikes – and maybe line up some preorders – we are all ears. Now that we have the basic controls and instrumentation, developing derivative systems is largely a pneumatic/mechanical design task. Development lead time and qualification testing would be on the order of 3 to 6 months, depending upon the installation. Yes, there is a one-year, no questions asked warranty. Dealing with the vintage motorcycle crowd means dealing with a user group that is honest and forthright 99% of the time. If you tell us there is problem, we are going to believe you and do whatever it takes to make it right. If you contact us after your system has crept out of warranty, we’ll probably take care of it anyway. The Ninja components (tank and regulators) carry their own one year warranty. By design, the KickMagic system has no scheduled maintenance and no replacement parts schedule. However, s**t happens and if you need parts, we have ensured that Pearse-Bertram, our industrial contract manufacturer, keeps spares on hand at all times for quick turnaround. Seems that way, but, “No, Dorothy, this is not a dream.” Stop staring at your old Triumph, wishing you could still kickstart it. Get your motor running again with some KickMagic! Will the KickMagic system be available internationally? Our initial systems will be sold in the US. We are working with our European partner, Alton (www.alton-france.com), based in France, who makes the Norton & Velocette starters as well as the generator systems we carry at The Classic Bike Experience, to be our distributor in that region later in 2018. Other international markets are TBD at this time, pending partnerships for local sales and support.